Basic and near utilitarian as far as design, but bordering on hotel luxury when it comes to craftsmanship and materials. This mattress pad is usually beyond our budget, but its current price point is too great a deal to pass up. What Is the Luxor Linens Francisco Mattress Pad Made From? How Does the Luxor Linens Francisco Mattress Pad Perform? How Do You Wash the Luxor Linens Francisco Mattress Pad? How Much Does the Luxor Linens Francisco Mattress Pad Cost? Mattress pads are usually overlooked when it comes to setting up a bed. But even people that appreciate what a good mattress pad can do may settle for the cheapest and most basic mattress pad they can find. That’s perfectly fine, but what if you’re wanting for a little bit of luxury? Enter: New Jersey-based Luxor Linens, a leading provider of fine bedding and bath linens since 2005. Their products are used by hotels like the Savoy Hotel and the Ritz Carlton, but they’re also great for home use. If you’re looking to level up your bed, Luxor Linens is a good place to start. They believe that genuine relaxation and a good night’s rest aren’t indulgences, but crucial to overall heath and wellness. Their world class products support that philosophy. Let’s look at one of the more affordable essentials in their product line: the Francisco mattress pad. The Francisco mattress pad is made from a soft but sturdy fabric blend of cotton and polyester. The wide diamond quilting secures the polyester padding within. It also features elastic corners for a snug fit. Luxor Linens is known for both their high standard of craftsmanship and the quality of the materials that go into their products. The Francisco mattress pad is no exception. It is ethically produced, with all elements sourced responsibly. Does Luxor Linens Use Organic and/or Recycled Fibers? 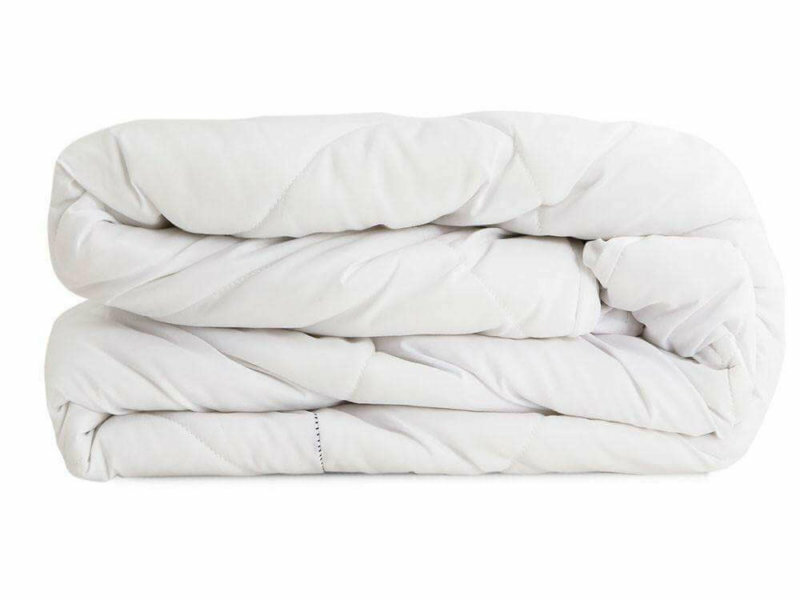 Curious to find out if Luxor Linens uses organic cotton and/or recycled polyester in the manufacturing process of the Francisco mattress pad? We are, too! Will the Francisco Mattress Pad Fit Your Mattress? The Francisco mattress pad is available in white only and is constructed to slip over your mattress like a fitted sheet. It is made in all six US standard mattress dimensions: twin, twin XL, full, queen, king and California king. However, as of this writing, two of the six sizes are sold out: twin XL and California king. The full dimensions of the Francisco mattress pad aren’t noted, so again we relied on Luxor Linens customer support to supply the details. Regarding the depth of the skirt, they note that “the pad fits mattresses up to 19 inches” thick. In terms of comfort and feel, the Francisco mattress pad performs admirably as a high quality product with a baseline design. What do we mean by this? Yes, the mattress pad is made well from great materials. It’s only natural that it will look and feel great. What’s unnatural is to expect it perform above and beyond its capabilities. For example: You may expect it to be waterproof, as some mattress pads are, but it isn’t. And while the Francisco mattress pad is soft and plush, it is not a thick pillow-top mattress pad or a mattress topper. It won’t significantly change your bed when it comes to support or pressure relief. How Does the Francisco Mattress Pad Feel? On a mattress, the Francisco mattress pad adds a relatively thin but noticeable soft layer that you will definitely feel when you lie on top of it. Think of it as having an extra comforter that you sleep on, while your actual comforter is free to be laid over you as a blanket. 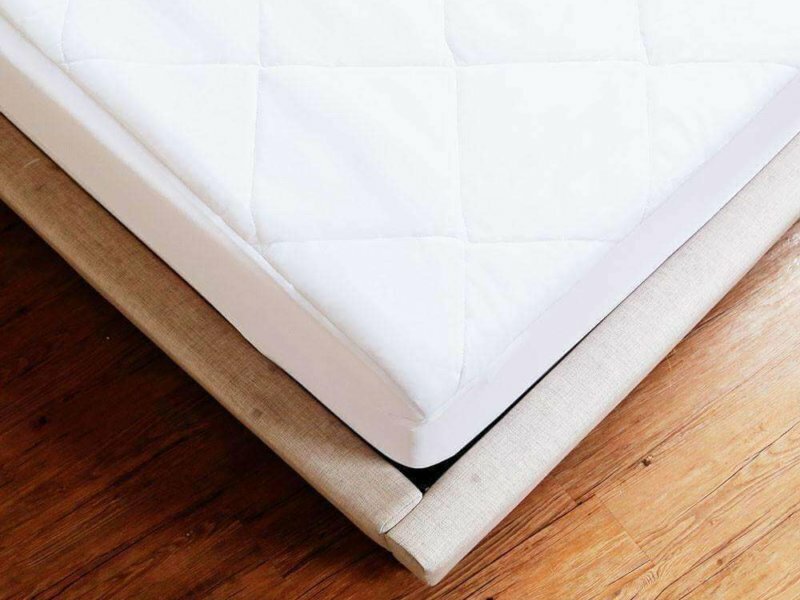 The Francisco mattress pad also fills in empty spaces and helps your fitted sheets look smoother, sleeker and sharper—no more sliding, bunching up or wrinkling. 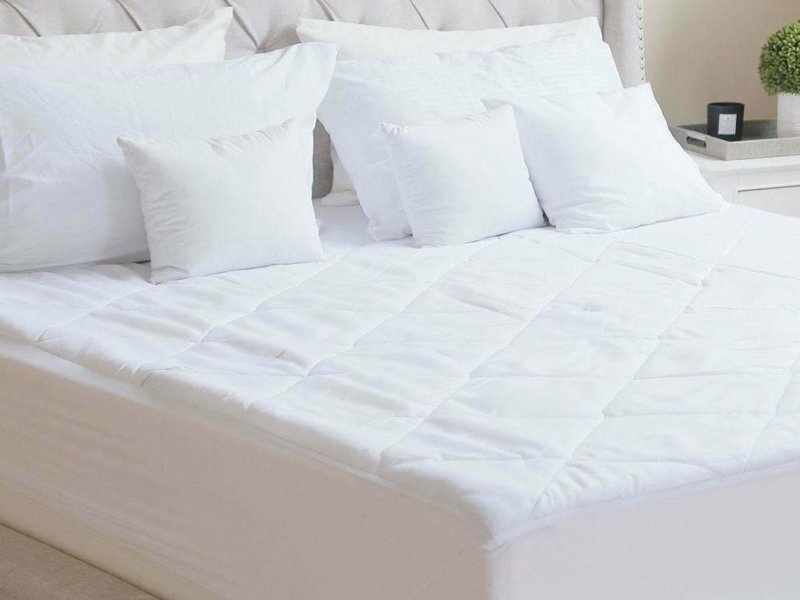 Like any serviceable mattress pad or protector, it can also keep a loose mattress topper in place under your sheets. Is the Francisco Mattress Pad Hypoallergenic? While it is not specifically marketed as a hypoallergenic mattress pad, it is made of hypoallergenic components. Let’s answer this with a tentative yes. Cotton is generally considered hypoallergenic—more so if it’s organic. Luxor Linens notes in the Francisco mattress pad’s displayed product details that the padding inside is made from hypoallergenic polyester, too. Does the Francisco Mattress Pad Smell? No, it doesn’t. This likely because the Francisco mattress pad is not only made well, but packaged well, too. Many mattresses and mattress accessories give off an unpleasant odor right out of the box. This is called off-gassing, and it’s a common occurrence, even with certified safe products. It’s especially prevalent with foam-based products or items that are packed and then kept storage for a long time. There are no very specific care instructions noted on the Luxor Linens official website. In general, cotton mattress pads should be changed and washed every two or three months. But you can change them more often—even put them on the same rotation as your bed sheets—if you feel like your personal habits and usage demand it. Just remember that more frequent washing may increase wear and tear, leading to a shorter usable lifespan. As of this writing, a queen size Francisco mattress pad is available on the Luxor Linens online store for a discounted price of $35.63. The price slashing puts the cost of the Francisco mattress pad almost at par with budget picks available in brick and mortar stores and large online retailers like Amazon. It’s a steal, too—the actual price, sans discount, is $73.91! Does Luxor Linens Offer Free Shipping? Domestic shipping in the US is free for purchases that go over $49. Return shipping—more on that below—is also free for US-based transactions, although returns of products that have already been washed or used may be charged a processing fee of $9.99. Luxor Linens offers several shipping options: next-day, standard, and 3-day. Do Luxor Linens Purchases Include a Trial Period, Return Policy or Warranty? The Francisco mattress pad comes with a 90-day trial supported by a return and refund policy. There is no explicit stated warranty included. You can use the Francisco mattress pad for close to three months before deciding if you want to keep it. Luxor Linens states that returns are free and will be refunded using the original payment method. Note, though, that a 100% refund is not promised! As mentioned above, only the return shipping fee is waived. A processing fee for used item returns will be charged to you. Luxor Linens is also known for offering monogramming and personalizing services. This probably won’t apply to any mattress pads you buy, but in case you order monogrammed items from them, note that they are considered nonreturnable. How Do You Return the Francisco Mattress Pad? It’s as easy as contacting Luxor Linens’ customer support and declaring your intent to return the item. As long as you do this within the 90-day window, they will be happy to walk you through the process. There are several avenues through which you may contact the company’s customer support reps: telephone, live chat, or through the contact form on their official website. Don’t expect a prompt reply, though. When we contacted Luxor Linens customer support to clarify some details about the Francisco mattress pad, it took them two to three days to replay via email. Live chat is similarly sluggish. There’s no queue system notification, so you don’t know if you’re being ignored or not. You may also follow them on social media and interact with the company there, but this is recommended for quick clarifications or questions only. Something as serious as a returning a purchased item should be handled through the most professional of their customer service channels. Note that instead of returning an item, you may also exchange it—these are always free. Ask customer support about this if you’re interested. What Happens to Returned Luxor Linens Items? Gently used returns are donated by the company to homeless shelters. You can even suggest a shelter that they can help out by filling out a form on the Luxor Linens website. On top of this, a fraction of their profits go towards helping local families that are in need of financial assistance. Visit Luxor Linens & Find Francisco Mattress Pad Deals Now! The original price tag of the Francisco mattress pad is by no means affordable for most. Good thing it’s now available for half the cost! This makes it easier for us to recommend the product, because a lower price point makes the Francisco mattress pad all the more worth it. As far as design goes, the Francisco mattress pad is baseline—almost utilitarian if not for the quilted top. The materials used and the fine craftsmanship are what sets it apart from typical mattress pads carried by your local bedding store or listed as bestsellers on Amazon. Bottom line: Yes, we do recommend the Francisco mattress pad with its current price tag. HOWEVER: Customer support could be more responsive. We would have appreciated more easily searchable or prominently displayed product information, too. Certain details that should be on the product page aren’t there, not even within the Help Center of the brand’s official website. How can they forget to list care instructions? Why isn’t the depth of the product listed, along with the width and length? Is the cotton standard, organic or Egyptian? Again, these are questions that we’ve sent to their customer support. We’ll let you know when they respond.